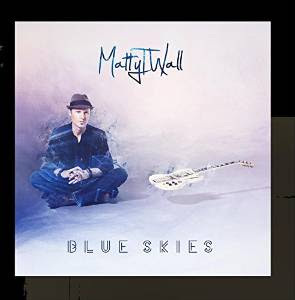 I just had the opportunity to review the newest release, Blue Skies, by Matty T. Wall and it takes the best from rock, pop and blues and blends it together for a crisp new sound. Opening with blues rocker, Burnin' Up Burnin' Down, Matty T. Wall grinds out a great rhythm guitar sound with a thick cut of sound. His vocals are solid and with strong support from bassist Stephen Walker, Gordon Cant on organ and Jasper Miller on drums, these guys rock the house. On Keb Mo's, Am I Wrong, Wall puts up a high energy level, rocking with a smoking bottom and rhythmic top. Original blues ballad, Love Gone Away, is a sweet Gary Moore style track with soulful vocals and high reaching ruitar lead. Bound to be a crowd favorite, this track is hot! Scorcher is a runaway train with machine gun picking, super harmonic bends and snappy country style drums work. Excellent! Title track, Blue Skies, has a catchy melody and nice harmonies with Deli Rowe making an ideal radio track. This Is Real is a lightly funk salted track with a jazzy bottom. Another track with strong radio appeal showing the lighter side of Wall. Hendrix's Voodoo Chile gets a total rework with a monotone bass bean and an almost spiritual arrangement on the vocals. Wall takes a new approach on the guitar lead blending Muddy Waters' style in making one of the most unusual and successful covers of this track I have heard in quite some time. Jamming for almost 12 minutes, Wall and crew really work this track out, pushing the envelope without repeating the past. Very nice. On Broken Heart Tattoo, the first thing that hits you is the snarl of Wall's guitar. With Walker on walking bass and light percussion by Miller, Wall casually tells the story as he throws quick blues riffs in a as accents before breaking into his guitar refrain. very interesting. Smile is a very nicely written track, basically acoustic rhythm guitar paired with airy melodic electric guitar lead. This is a very cool track. Wrapping the release is a modern stylized acoustic folk cover of Robert Johnson's Hellhound On My Trail. With a lightly covered Dazed and Confused acoustic undercurrent, tension is add against Walls solo vocals, augmented by percussive guitar and drum rhythms. A very cool closer for a pretty strong release.